My name is Lauren O’Neil, and I am a senior at Salve Regina University with a major in English Communications and two minors in Marketing and Film. I have spent the past Fall semester as a Communications/Marketing intern for Gray Matter Marketing. I am originally from Burlington, Massachusetts and growing up, I never had a crystal clear idea of exactly what I wanted to do for a career. Because I am graduating in a few months, I have had to start thinking very seriously about my future. Working here at Gray Matter has really helped me to narrow down and define what I want to do. I always knew I wanted to find a career that would allow me to work with people and the community around me, but I never knew exactly what that would be or look like. After enjoying my time at Gray Matter Marketing, I am definitely interested in event management. Events like road races, brew fests, and festivals make people happy and excited to spend their day doing something they love, whether that is running, drinking beer, or doing both of those while also listening to music. I would love to find a career that involves making people happy. My favorite part of being an intern at Gray Matter Marketing is undoubtedly the events. I loved seeing how delighted the participants were during an event that we put on, like the Amica Newport Marathon, the Ocean Road 10K or the Cape Cod Brew Fest. So much hard work went into preparing for all of these events, and it really shows with how well-put-together they end up being. 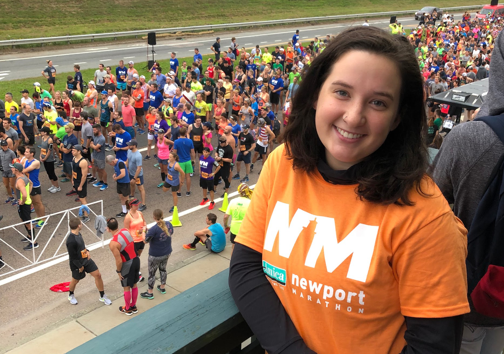 For example, the Amica Newport Marathon took a lot of preparation and hard work to organize, and it was really rewarding to see how excited the runners and spectators were from the start to the finish line. After each race I worked at, I loved seeing how every single runner was so proud of themselves, and how happy they were with the outcome of their day. The number one reason that I wanted to come intern for Gray Matter Marketing was, because I love to see my work actually affect people. I had seen what Gray Matter Marketing did for events and how excited people were about them on the Facebook pages and even in person. A few of my friends from Salve have done the half marathon and they absolutely loved it! Just by seeing how happy they were with the events I knew I would enjoy working at GMM. I want to know that what I am doing is important, and working here at Gray Matter Marketing has really done that for me, even though it has only been a few months. The people I spent my time with were all so kind and the culture here is so different from anywhere else that I have worked. I look forward to coming into the office every day. Although I am just an intern, I know that the work I assisted with leading up to all of the events really paid off and contributed to making those days great for the participants, as well as helping me to realize what I want to do with my future. Thank you, Lauren, for all of your hard work this semester!